Aching – Legs typically ache and feel heavy at the end of the day or during prolonged standing and are more comfortable when elevated. 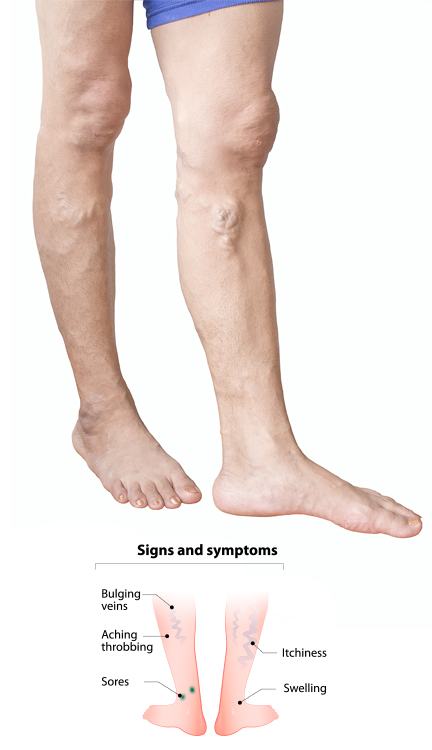 Itching – The commonest symptom of varicose veins! Ankle Swelling – Better in the morning, worse at the end of the day (gravitational). Longstanding Venous reflux results in high pressure in the veins (Venous hypertension) and slow, inefficient blood flow (Venous Insufficiency). This can result in complications that can be especially distressing, unpleasant or even dangerous. Thrombophlebitis – Blood flows inefficiently within thick walled, dilated veins and is therefore prone to clotting (thrombosis) causing the vein to become hard and tender. This incites an inflammatory response (phlebitis) leading to redness, swelling and pain. Thrombophlebitis may be complicated by lasting skin damage, discolouration or occasionally even Deep Vein Thrombosis (DVT). Bleeding – Uncommon but alarming. Small, very superficial veins (we call them High Pressure Reticular Veins) dilate under high pressure and may bleed quite dramatically. The highest pressure is low down around the ankle and foot. An area of high pressure reticular veins here is called Corona Phebectatica Paraplantaris. These veins are a sign of significant venous insufficiency, are quite disfiguring and often bleed. Ulceration – High venous pressure is the commonest cause of leg ulcers, the most feared complication of varicose veins. It is difficult to predict who is going to develop serious complications from their veins, but those with incompetent valves and severe venous reflux in one or more truncal veins are probably at higher risk.